This year's Black Friday is bigger than ever with stacks of savings and a free webinar up for grabs. 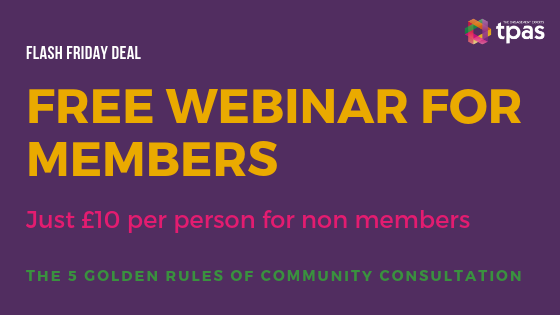 Join our free for members webinar and we'll walk you through our five principles of good consultation in detail. Follow these rules and you’ll ensure your consultation activity reaches an excellent standard. Not a Tpas member? Not a problem, for just £10 you can join us too. 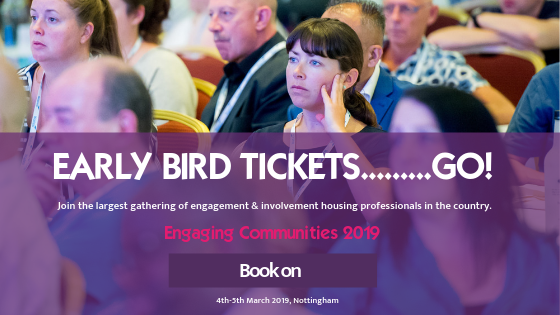 Following the Social Housing Green paper, 2019 looks set to be a significant year for housing with those having responsibility for resident engagement taking centre stage. Grab a discount off a delegate ticket now. This year you can save £100 off a tailored course, delivered in a venue of your choice. With a wide range of topics on offer including housing legislation, scrutiny and digital engagement we can provide training for staff, board members, councillors and tenant/resident volunteers across the country. We're taking £100 off our typical rates for delivering a bespoke in-house course for you. A one day in-house course will cost you £620* with the deal if delivered to tenants (normally £720) and £755* with the deal if we're training housing staff (normally £855). A one day in-house course will cost you £720* with the deal if delivered to tenants (normally £820) and £855* with the deal if we're training housing staff (normally £955). *Exact costs of the course will depend on your location and learning outcomes. Contact us for a quote. Training needs to be booked by 31 December 2018 and delivered within 6 months of booking. Applies to full day courses only.